In the classic clash of soap bubble against drop of water, the astonishing winner is the bubble. This is because of the bubble's capability to "self-heal" as the drop first squelches down through it, and then back up over it again. I'll give you some of the physics behind the process of why the bubble can restore itself. Seeing the soap bubble sliced, not just one time but twice is cool enough, but then the colored drop of water washes down the side of the bubble like the bubble is a dense body. It's without any doubt so cool. How does something so insubstantial self-heal? To know the reason behind it, we try to understand the Marangoni effect. The outcome is not much complex than the trend of molecules in a fluid to pull away from liquids with low surface tension, and towards liquids with great surface tension. It's accountable for, also for other things, the "tears of wine" that you see dripping down in a wine glass. Soap drops the surface tension in water. This is portion of why bubbles can form. If you one way or another prepared water molecules in the shape of a soap bubble, but didn't add any soap, the water molecules pull at each other toughly so that the bubble would pull itself apart. In a soap bubble, the soap-to-water ratio isn't the same. Some spaces have a little more soap than others. Those spaces with generally water have a greater surface tension. The molecules tug together there, and as they tug together, they carry more soap molecules into the mix. In the meantime, spaces with too much soap bounce out until the soap molecules are so delicately detached that it starts dragging together again. A soap bubble is a self-healing structure. 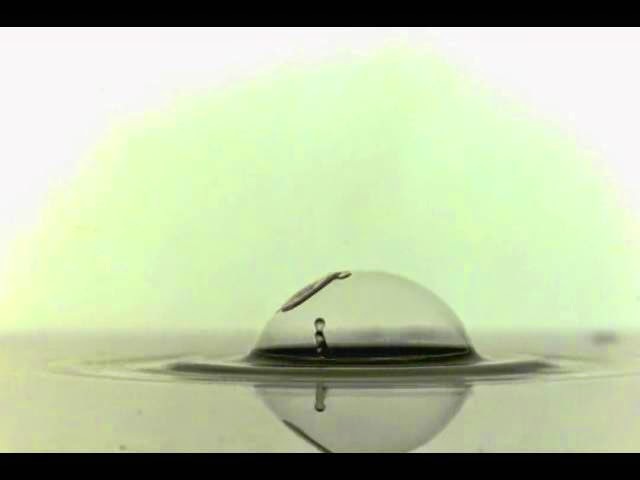 When we see the drop go through the bubble, it's discarding a lot of water into one part of the surface of the bubble, which sources the bubble to pull together about that part. The soap flashes in, retains the bubble organized.